The detail view is where you manage the logistics or warehouse operations for products on an opportunity or project. If you have a barcode scanner, use that to scan through each of the stages of the warehouse process. Otherwise, you may use the detail view as a digital picking list, ticking boxes in the web interface. 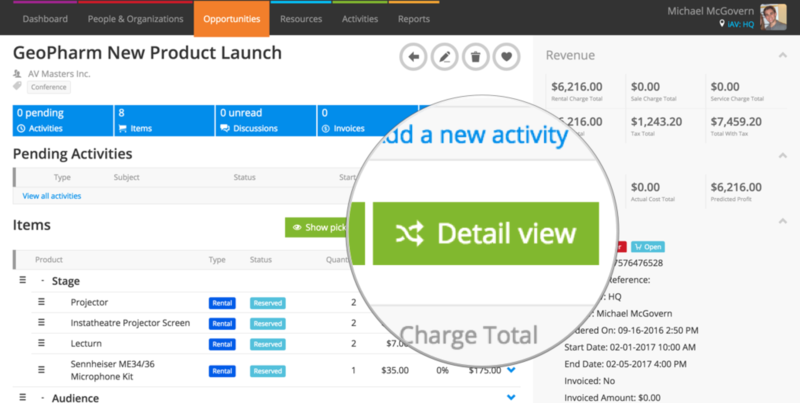 To access the Detail View, click the green Detail view button at the top-right of the items list of an opportunity. It’s available when your opportunity is a provisional quotation, reserved quotation, or an order. There’s five steps to managing your warehouse operations in the detail view. Each of these steps has a tab in the detail view. Allocation is where you tell Current RMS which serialized stock is being used on this order. For bulk & non-stock items, it’s a chance to say those particular items have been picked. Prepare means different things to different companies. Generally speaking, marking items as prepared means that the kit has been checked over or loaded onto a vehicle. Book out an item when it’s left your store or when it’s arrived at site. Your order turns from open to Active at this point. When goods return, mark them as checked-in to tell Current RMS that those are back in your store. You can check-in to availability or, if items are damaged, to the quarantine. Complete a product to mark it as fully returned. Each of the steps in the process is quite general and can be tailored to suit your business. Only book out, check-in, and finalize check-in are required; don’t worry about allocating or preparing if the opportunity doesn’t require it or if those steps don’t fit your processes. You can move back in the process by using the Revert Status option in the Action menu. The items list in the detail view is different to the items list in the order view. 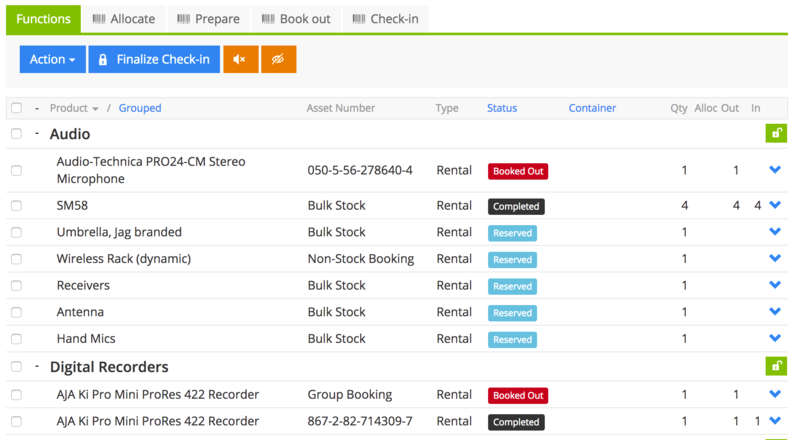 It displays a breakdown of any assets, as well as figures for how many items have been booked out and checked-in. Like the order view, items are nested within opportunity groups and any accessories are nested under their parent product. 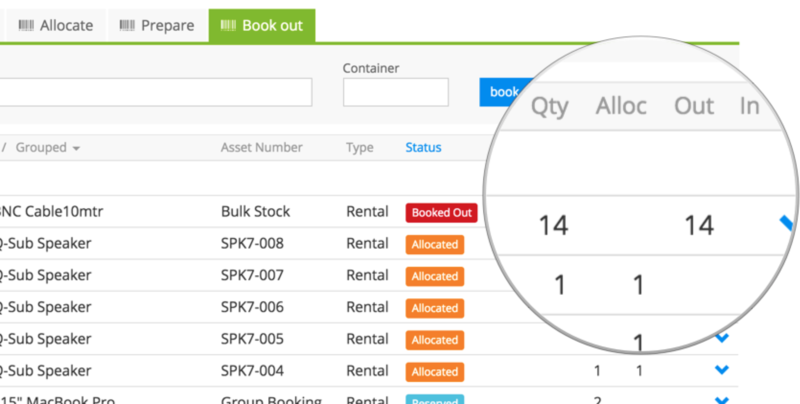 Where serialized products haven’t yet been allocated an asset, you’ll see “Group booking”. As you allocate serialized stock levels to that product, the “Group booking” line will be updated with lines for each asset. You don’t need to allocate stock to the line in order to mark as prepped or booked out. It will remain a “Group booking”. By default, the detail view is sorted by opportunity group (“Grouped”), meaning it mirrors the the order view. Click or tap the Product, Grouped, Status, or Container columns to sort the list. “Product” groups items by product group. “Status” groups items by the status of that particular line. There’s a quick overview of each of the statuses in the next section. If you’ve set containers, choosing “Container” groups by the Container you set. Grouping by status is especially useful. Scanned items move from the top of the list to the bottom so you can better focus. Collapse groups that you don’t need to see using the arrow to the left of the group name. You can also collapse products with accessories, perfect if you’re working with a serialized container with a lot of assets included. To collapse all groups, use the icon at the collapse icon at the top of the list. Hit the green padlock icon to the right of a group to lock it. When you lock a group, all other groups are collapsed and grayed out, and any scan operations only apply to assets in the locked group. Locking a group is especially useful if you have the same product in multiple opportunity groups, e.g. if you’ve created a quotation sorted by room or area. What are the asset statuses? Once an opportunity is converted to an order, stock is reserved. This is the initial status. Items are awaiting allocation. When serialized assets have been selected for a group booking or bulk or non-stock has been allocated, the line turns to allocated. Allocation is optional. If more than one asset has been specified for a line and you’ve not allocated them all just yet, the status will be mixed to let you know that you've allocated some assets but some remain unallocated. Prepared is a secondary check after allocation before an item is booked out. It means different things to different business. Preparation is optional. When the item has left the store or arrived on site, mark it as booked out. When you've checked-in some of a bulk or non-stock line, it's marked as part checked in. The final columns give a breakdown of how many were booked out and how many have been checked in. When you fully check-in the quantity of a line, it changes to checked in. Once you've completed check-in and finalized check-in, the line is marked as completed. You can't modify details of a completed item. If you use the "move outstanding items to a new opportunity" tick box as part of the finalize check-in process, those items are marked as moved. The final columns give you a breakdown of the quantity of that particular item or asset, how many have been allocated, how many were booked out, and how many have been booked in. Keep in mind that the out and in figures are cumulative totals. This means if you book out 10 of a bulk stock item and check-in 4, the quantity in the out column will remain at 10. This number is a record of how many you booked out, not how many are still out. Current can make an “accepted” noise and a “rejected” noise when you use a barcode scanner on the Allocate, Prepare, and Book out tabs. 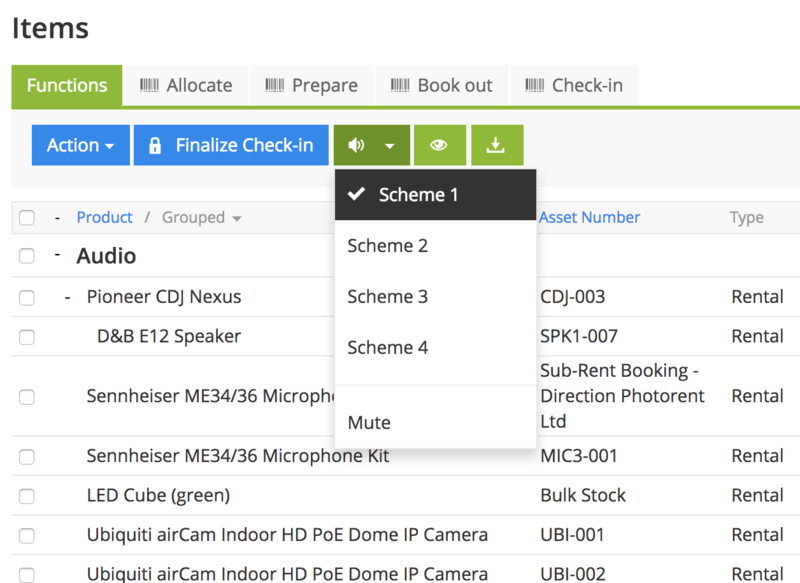 Choose your sound scheme using the speaker icon on the Functions tab. Multiple users can work on the detail view on the same opportunity or project at the same time. To see other users scanning operations in real time on your screen, click the eye button on the Functions tab. Other users’ scan operations are highlighted in lilac. You won’t see other users’ scans if you’re sorting the detail view in a different way to the user who performed the scan.